Published: Oct. 9, 2011 at 04:41 p.m.
(4:49) B.Roethlisberger pass short left to H.Ward for 5 yards, TOUCHDOWN. (11:19) B.Roethlisberger pass short middle to H.Ward for 7 yards, TOUCHDOWN. 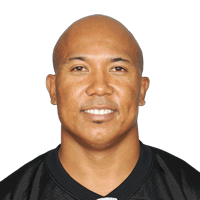 Published: Oct. 9, 2011 at 03:07 p.m.
Steelers QB Ben Roethlisberger finds Hines Ward again for a 7-yard TD pass to go up big on the Titans, 28-3. Published: Oct. 9, 2011 at 02:03 p.m.
Steelers QB Ben Roethlisberger hits WR Hines Ward for a 7-yard TD to go up 14-3 on the Titans.